A Reliant Regal three-wheeler used in the hit TV comedy Only Fools and Horses has sold for more than �,000. The battered van, emblazoned with the sign Trotters Independent Trading Co, went for �,227 - more than double its original estimate. Boycie and Marlene, two of the best-loved characters from BBC hit sitcom Only Fools and Horses, are to reunite for the spin-off Green, Green Grass. The BBC confirmed that a pilot episode about the dodgy car dealer and his long-suffering wife is being filmed. If the pilot, written by Only Fools and Horses creator John Sullivan, is a success it will become a series. The actors, John Challis and Sue Holderness, are the only ones from the original series taking part. The stars of Only Fools and Horses, David Jason and Nicholas Lyndhurst, will not be involved. Green, Green Grass will see Boycie and Marlene moving out of Peckham for a more refined life in the country, along with their son Tyler. The pilot will go into production next year, with a potential series being ready for broadcast in 2005. A BBC spokesman said there were no plans for any more episodes of Only Fools and Horses, but added "never say never". The final episode in the trilogy will be shown on Christmas Day 2003 (25th December). The final episode called Sleepless in Peckham sees Del & Rodders struggle to pay off their inland revenue bill. At present the episode is schedule on BBC ONE at 21:10, but this could be subject to change. John Sullivan the writer of Only Fools and Horses is planning to write a prequel to the episodes broadcast so far, he will go back to 1962 and focus on Del and Rodney's mother and father as well as Delboy as Mod. However, at present there are no plans to broadcast the show as a TV series, it will be written as a book which will be released in the near future. Keep checking the site for more details as we get them. The final two episodes of Only Fools and Horses could broadcast this Christmas. The cult series recently came back for a trilogy of new episodes, the first of which was broadcast last Christmas. The remaining two are expected to air on Christmas Day and New Years' Day, according to John Challis, who plays Boycie. "The favourite time now looks like one on Christmas Day and one on New Year's Day. They are going for the optimum audience," he told TeleText. "It's become a sort of Christmas institution - it just isn't the same without Only Fools. "The two episodes are really back to the traditional ducking and diving of the old shows. They're full of misunderstandings and things going wrong." A BBC spokesman said that a festive transmission was a "possibility." David Jason says this year's Christmas episodes of Only Fools And Horses will definitely be the last. The comedy attracted 20 million viewers when it was revived for a one-off last year for the first time since 1996. The BBC will screen two more episodes this Christmas. But Jason told the Sunday People: "We love the show but there will be no more. "This time it really is the end.". In the final two shows, the Trotters go to France for a reunion of Uncle Albert's wartime friends and then face eviction from their flat. Del Boy and Rodney will accidentally bring a stowaway back from France in the show's next special. The episode of Only Fools And Horses reportedly sees them going across the Channel. The pair join a reunion of Uncle Albert's wartime pals and try to smuggle home cheap booze on the way back. The new episode also stars former Z Cars actor James Ellis, reports The Sun. It is due to go out on BBC1 later this year. The show's Christmas special boosted the BBC in the ratings war, with more than 20 million viewers. It's official the figures have now been released and Only Fools and Horses once again topped the TV ratings for Christmas 2001 in the UK, with 20.35 million viewers tuning in for the first of three brand new episodes, it beat the BBC's usual Christmas favorite, Eastenders, by a staggering 1.3 million viewers. Only Fools and Horses was the clear winner in this year's Christmas ratings war. Unofficial overnight estimates indicate that 20.3 million people tuned in to see the return of Del Boy and Rodney. It compares to around 12 million attracted by ITV1's top programme, Coronation Street. The figure is expected to rise in two weeks time when the official statistics are released, which take into account video recordings. It was the first outing for Del and Rodney since Christmas 1996, when the pair became millionaires after happening upon an antique watch. The last episode in that trilogy attracted a total of 24.35 million viewers. Yesterday's programme showed the two enjoying the high life in the south of France before whittling away their fortune on a dodgy South American investment. They then return to their flat in Peckham, south London, and start up their old dodgy dealings in an attempt to regain the money. The show pulled in 73% of all television viewers at the time it was screened and was up against a yuletide edition of ITV1's Stars in Their Eyes. A limousine-style version of Del Boy's famous three-wheeler has been unveiled. The digitally created Reliant Rialto van is to advertise this year's Only Fools and Horses Christmas special. It will only appear in the trailers and not in the programme. Digital effects artist Aron Baxtor from Condor Post Production mapped digital images of the side of the van on to the film to create the body of the limo. Richard Heeley, the BBC producer behind the trailer, said: "It was an idea we cooked up just for the trailer. It's quite a good double joke. "First of all you see the apparently normal Rialto shot from behind but juxtaposed with a Porsche and a Ferrari in a glamorous Monte Carlo setting. "Then you see it from the back. Those shots in themselves look funny but the punchline comes when you see the shot from the side and it turns out to be a limo." Watch the promo in our Video Clips Section. The National Grid says it will be able to cope with any power surge for the Christmas return of Only Fools And Horses. There had been reports the Grid would have to go into overdrive to cope with demand. A spokesman said a surge is expected, but the Grid will be prepared. Only Fools And Horses returns on BBC1 at 9.05pm on Christmas Day. The current power surge record holder is England's World Cup semi-final match against Germany in 1990. But a National Grid spokesman told Ananova: "Some TV programmes do cause surges in demand but we're very used to dealing with these situations. "We're certainly expecting a problem." Jonathan Ross has helped to salvage the Only Fools And Horses Christmas special. He has stepped into the breach to play the host of a fictional TV quiz for the show. The BBC had to scrap its original plans to have Del Boy appearing on Who Wants To Be A Millionaire? The corporation clashed with ITV over the rights to repeats of the episode. But a re-written version of the scene has gone ahead with Ross in the hot seat of a big money TV game show rather than Chris Tarrant, reports the News Of The World. David Jason says that Only Fools and Horses isn't the same without Uncle Albert and pub landlord Mike. He says the deaths of actors Buster Merryfield and Kenneth MacDonald have changed the feel of the show. Merryfield died in 1999 and MacDonald suffered a fatal heart attack in August this year. "It changes the balance in the show - they're missed," Jason says. "Certainly Ken MacDonald was a tremendous funster. He never stopped laughing and playing practical jokes. He was just wonderful." But Jason is glad to be back on the show, which was filmed in Weston-super-Mare and the south of France. "I didn't expect to be back but it's a very pleasant experience," he said. "Nicholas Lyndhurst and I get on so well, it's a joy to work with him, and because of that we're still here. If we didn't get on, I wouldn't be doing this." Del Boy is to take part in a fictional TV quiz for the Christmas episode of Only Fools And Horses. The BBC had to ditch their original plans to pitch Del Boy against Chris Tarrant in Who Wants To Be A Millionaire? They rowed with ITV over the rights to repeats and the episode had to be modified. Comedy writer John Sullivan has devised an imaginary show instead, reports The Sun. A vintage scene from the BBC's hit comedy Only Fools And Horses has been voted favourite Christmas TV moment of all time. The Heroes and Villains episode, in which Del Boy and Rodney dress up as Batman and Robin, won 35% of the vote. The 1996 episode was chosen by viewers in a poll commissioned by cable TV company ntl Home. The Trotters' also managed another spot in the top 10, with their 1989 episode in which Del Boy falls through a gap in a bar, coming in at number four. Rod Henwood, director of TV at ntl Home, which interviewed 1,500 viewers for the poll, said: "It seems that, at Christmas, we all prefer the slapstick of Hookey Street to the gloom of Albert Square. A Christmas special of Only Fools And Horses featuring Del Boy as a contestant on Who Wants To Be A Millionaire has been scrapped. The scene would have united the BBC and ITV during the traditionally competitive TV season. However, it has been pulled after they could not agree on the rights to show repeats. ITV requested that in exchange for "borrowing" the Who Wants To Be A Millionaire brand for the show, the BBC should allow it to screen a repeat at a later date. But the BBC said it was not prepared to use license fee payers' money to fund a show containing a short clip which meant it would be repeated on ITV. A BBC spokesman said: "The scene featuring Millionaire was one of a number of ideas written by John Sullivan for the Christmas special. "However it would be impossible for the BBC to use license fee payers' money to provide a repeat for a five-minute scene." An ITV spokeswoman said: "We were very happy in principle to help with the idea but on the basis that we were able to repeat the episode later once the BBC had shown it. "But they were unwilling to do that." Filming of the Christmas special, starring David Jason as Del Boy, will continue but with a different plot. Only Fools And Horses stars could still be filming their Christmas special a day before it is due to go on air. The BBC plans to show the comedy on Christmas Day. But production delays mean scenes might still need to be shot just 24 hours beforehand. Sue Holderness, who plays Marlene, told the News Of The World: "When I hear they'd be filming on December 24 I thought 'How are they going to do that?'" She is due to start filming next week. But some stars have not had their scripts yet. John Challis, who plays Boycie, said: "It's going right down to the wire." "We still haven't seen any of our lines." The festive special will be the first new Only Fools And Horse episode for five years. Challis said writer John Sullivan wanted to make sure he was happy with it. "He's an utter perfectionist who's taking his time over the script," he said. Del Boy Trotter will appear on Who Wants to be a Millionaire in the new Only Fools and Horses mini series. Chris Tarrant will grill Del in the feature length episode - one of three expected to be screened over Christmas. Rodney will be in the audience. Details of how much he wins are secret. It's thought to be the first time BBC1 and ITV have collaborated in such a way on a programme. Only Fools and Horses writer John Sullivan told The Sun: "I suggested the whole thing to the BBC who immediately said, 'Great'. "So I phoned up David Liddiment, ITV's Director of Programmes, who agreed to it right away. For the two rival channels to get together in this way is really ground-breaking stuff." All he could reveal about Del Boy's performance is he specialises in sixties rock. DAVID JASON CONFIRMS NEW SERIES. The veteran actor will start filming the reunion show for BBC1 next month. He says he has no plans to retire from acting. David told Teletext: "There will come a time when I will stop acting. "But while I still get such good projects, I'll carry on. I like to do every project and give it my best shot." He is also set to star in ITV's four-part series Micawber, in which he plays the Dickens character Mr Micawber. David adds: "When you get offered a project that is very good and interesting, it is very difficult to turn it down. "I did a Frost this year as well as Micawber and you find you have an embarrassment of riches." Micawber will be shown on ITV around Christmas. A Cleckheaton firm is the mastermind behind the demolition of flats which were neighbours to TV's Del Boy and Rodney. Barrie House, a 21-storey block on the South Acton estate, London, is less than 200 yards from the flat used to film one of the BBC's most popular sitcoms Only Fools and Horses. Cleckheaton-based Controlled Demolition Group began its �0,000 project at the end of July when a 24-man team began stripping the condemned block of its exterior concrete. After this the firm's explosive experts moved in to place 25kg of explosives and 1,500 detonating charges. A 150-metre exclusion zone was in force for the day of the "blow down" yesterday. Residents from 274 nearby homes were evacuated. Two of the stars of the TV show, Paul Barber (Denzil) and Sue Holderness (Marlene) pressed the button to trigger the tower's collapse. 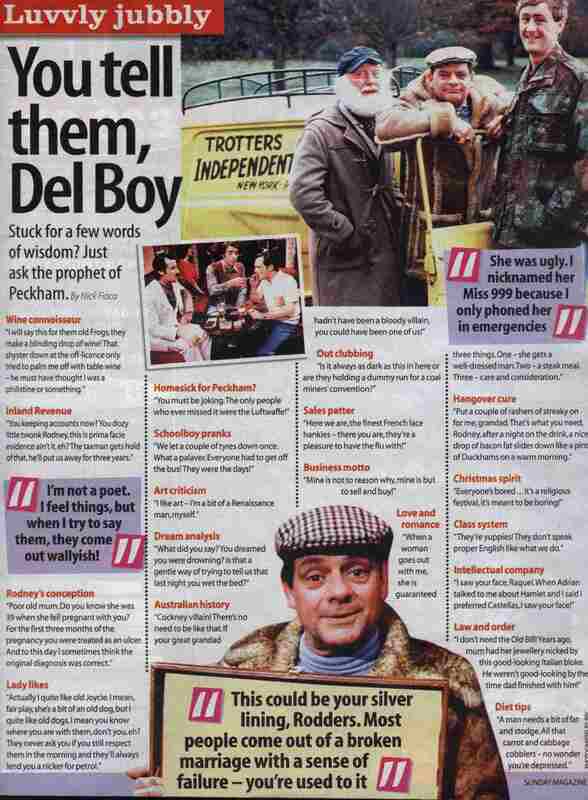 Last Sunday's News of the World's supplement magazine Sunday, included an article listing some of Delboy's all-time favorite sayings. Click Here to view the article. BBC chiefs were branded plonkers last night after a leak about stars' pay threatened the comeback of Only Fools and Horses. The details revealed that Del Boy actor David Jason will pocket �0,000 for three planned Christmas specials of the smash-hit telly comedy. That's MORE than co-star Nicholas Lyndhurst, Del's brother Rodney on screen, had been promised. He is still in delicate negotiations over the revival - and has yet to sign up. BBC insiders say his agents were stunned when they learned of Del's nice little earner. Bosses fear Lyndhurst, 39, may get the hump and refuse to appear. A source inside the Beeb said: "It has caused chaos and today has been a nightmare. "The production is in disarray because Nicholas hasn't signed up yet. "There have been high-level negotiations about money and this has put a spanner in the works. But a more likely outcome is they will have to cough up more licence payers' cash to secure his services. Kenneth MacDonald, alias landlord Mike in Only Fools and Horses, has died. The 50-year-old actor suffered a heart attack while on holiday with his family in Hawaii on Sunday night (5th August 2001). His Only Fools And Horses co-star David Jason says it was like "losing a member of the family". MacDonald also starred in BBC1 sitcom It Ain't Half Hot Mum and Channel 4 soap Brookside. His character Mike Fisher in Only Fools and Horses was last week voted runner-up in a poll to find TV's top pint-puller, beaten only by Coronation Street's Bet Lynch. Kenneth's family are making arrangements to return his body to the UK for a quiet family funeral next week. He leaves a wife, Sheila, and children Charlotte, 14, and William, 15. The writer of classic television comedy Only Fools and Horses is working on a script for possible new episodes. Actors David Jason and Nicholas Lyndhurst last appeared as hapless wheeler-dealers Del Boy and Rodney five years ago, attracting 24 million viewers in the Christmas ratings war. The Guardian now reports the BBC planned to spend �million per episode on the new series for the comedy which began in 1981. A BBC spokesman said: "We can confirm John Sullivan is working on a script for Only Fools and Horses. "All parties involved are keen to work on it." The newspaper said that producers of the show are hoping the programme would return in time for Christmas Day. According to the paper, the first of the programmes will open with the funeral of the much-loved character Uncle Albert. The actor who played the role, Buster Merryfield, himself died two years ago. Early indications state that in the new series Del and Rodders are down on their luck once again and back in Peckham. People living in a city suburb are protesting about the name of their street - because of its connections with Only Fools and Horses character Del Boy. Almost everyone living in Trotter Haugh, a terrace of modern houses in Morningside, Edinburgh, have asked for the name to be changed. They believe it is associated with Derek Del Boy Trotter, the star of the television comedy who lived in a Peckham tower block council flat. One resident, political researcher Peter Warren, 33, was under the impression the street would be called Mortonhall Place before he moved in, as it was the name developers worked under. He said: "When people hear the word Trotter, they think of Del Boy or pigs. It is the combination of trotter and Haugh which is impossible to convey across the phone apart from anything else. Only Fools And Horses could make a comeback for the first time in five years, according to the actress who plays Marlene. Sue Holderness says the show's producer has asked her agent to keep dates in November free for filming. Attempts to bring back the hit sitcom have been frustrated by the heavy workloads of David Jason and Nicholas Lyndhurst. The series could be back for three episodes. Ms Holderness told the Daily Mail: "We have heard that the producer has phoned our agents and said keep these dates free, and that's about as close as you get until you sign on the dotted line." The Only Fools and Horses Appreciation Society are planning on opening an Only Fools and Horses Museum. Details of the event were aired on Anglia Televisions local new program tonight (20th July 2001). Go to the sound bytes section of the site for the Audio from Anglia's report. Or watch it by going to the video clips section. The series includes Happy Returns, Strained Relations, Hole In One, It's Only Rock and Roll, Sleeping Dogs Lie, Watching The Girls Go By and As One Door Closes. For pricing information and to pre-order your copy now click here. Early this morning (20th July 2001) the remaining five housemates discussed Only Fools and Horses, Paul, Dean and Elizabeth told of their favorite moments. You can hear what they had to say by going to the sound bytes section of the site. Joan Sims, famous for her roles in the Carry On movies, has died aged 71. The star, who was in more than 20 of the saucy romps, died after a lengthy illness. "She had been ill for some months," said a spokeswoman for her agent. Her most recent movie was the BBC TV film Last Of The Blonde Bombshells in which she starred with Dame Judi Dench. Ms Sims, who lived in London, was famous for a string of innuendo-laden performances in the Carry On films. She had been one of the last surviving regular members of the cast which included comic greats Kenneth Williams and Sid James. Her roles in the series included Lady Ruff-Diamond in Carry On Up The Khyber, Emily Bung in Carry On Screaming and Gloria Passworthy in Carry On Constable. She also notched up a number of TV roles including Auntie Renee in Only Fools And Horses and Madge in As Time Goes By. Stars and writers from the world of entertainment lined up in London for The Heritage Foundation Awards. The awards celebrate outstanding comedy achievements from television and radio alongside comedy performances and script writing groups. Sun newspaper readers and a panel of directors voted for comedy favorite Only Fools and Horses as Best Television Comedy Show. It has been announced that the 3rd volume of the popular book the Bible of Peckham is to be released on the bookshelves on 18th October 2001. At the time of writing I have no confirmation on exactly what the book will contain but judging by volumes 1 and 2, it's likely to contain the remaining unreleased scripts to the series, along with some more facts. When I find out more I will post it on the site. In the meantime you can preorder your copy now for delivery when it is released click here for more details. Plans for a comeback series of Only Fools and Horses have been shelved. David Jason says the birth of his daughter was like a scene from his hit show Only Fools And Horses. He said medical staff in the delivery room expected him to turn round and say "Oh, it's a little baby" in his Del Boy accent, like the moment Damien was born into the Trotter household. The 61-year-old, speaking on Saturday night's edition of BBC1's Parkinson, became a father for the first time in February when partner Gill Hinchcliffe gave birth to Sophie Mae. He told Michael Parkinson: "I went in to the operating theatre where Gill was delivering the little dot - the place was full of operating staff and anesthetists. "(The baby) was wrapped and brought to me. Of course, ever single person in the room watched to see if I was going to say (adopting Del's accent) 'Oh it's a little baby'." Jason - in his first major television interview for a decade - said he had been bombarded with stories about how he would never get any sleep: "All of that went on, but when she arrived it was a quite emotional moment, I must admit." The actor described Sophie as "a little fart machine". He described how at two days old "milk was going in one end and hanging about a bit in the middle", then she would pull a strained face and pass wind loudly. "How on earth does she know how to do this at two days old? And she makes a red face like I do," Jason joked. Asked about why he waited so long for a child, the actor said: "I didn't actually wait, it was thrust upon me I think. My life has been in reverse. It wasn't fame and it wasn't money, but I always wanted to succeed. The only way I could do that was to try with every job to be better than I was in the last one, and to learn. "Because of that I needed to be footloose and fancy free. I needed to go where the work was. As soon as things started to get heavy with a relationship, I'm afraid I was one of those that would (be) off, gone. Only because, I knew for me I couldn't be responsible for a family and the silly work I was doing." The much awaited Only Fools and Horses selection box is to be released on 26th March 2001, it was previously only available to members of the Britannica music video club, but now the beeb have decided to put it on general release. The video is hosted by John Challis (Boyce) who along with other stars re-live the favorite clips from all of the episodes to date. To order this video for only �99 click here. Creator John Sullivan has written three hour-long specials, based around the funeral of Uncle Albert. Stars David Jason and Nicholas Lyndhurst are reportedly keen to return to the show. Sullivan told The Sun: "We're on. All the studio dates have been pencilled in. The stars are up for it and I have the bones of the story in place." The episodes are expected to be screened at Christmas with BBC bosses hoping to match the 24 million viewing figure for the last Only Fools And Horses episode five years ago. The last show saw the Trotters become millionaires at last after finding an antique watch. And Del swapped his Reliant Robin for a Roller. David Jason has become a father at the age of 61 after his partner Gill 41 gave birth to a baby girl. Gill was taken to Stoke Manderville hospital in Aylesbury. David was present when she went into labour and their 9lb 6oz child was delivered by Caesarean section. David said "the baby is absolutely delightful". Only Fools And Horses is to return to TV screens with the first new episodes since a one-off Christmas special in 1996. Both David Jason and Nicholas Lyndhurst are believed to be free to start filming the comedy in the autumn. BBC bosses are thought to hoping the series will be finished in time for Christmas, although a spokesman declined to say when it will be aired. The Daily Mail reports that the BBC is hoping the show will help it to improve on last year's Christmas ratings. Yep, series 2 has been confirmed to be released on 2nd April 2001 on DVD, it contains all episodes from series 2 on 1 DVD. Series 2 includes the hilarious moment when Del, Rodney and Granddad attempt to clean a chandelier. Its not clear so far what, if any, special features are to be included on the disc. Click here to pre-order yours for delivery when it's released for only �.99. DEL Boy will be gutted. Here's that plonker Rodney prancing about with his newborn baby. And poor Del's still got weeks to wait before he becomes a daddy for the first time. It gets worse. Rodders - Nicholas Lyndhurst - was poshly up West shopping with wife Lucy and sprog. Yer Harrods, no less, in London's finest Knightsbridge. While Del, alias David Jason, was down East. And, no disrespect to the Waitrose store in Romford, Essex, it's not quite the same. He looked a mite tired and unkempt as partner Gill Hinchcliffe left him to carry the bags - but he has a big new future ahead. David will be 61 on Friday. Gill, 41, is expecting their baby in March. And they've already started decorating the nursery at their home near Aylesbury, Bucks. Fatherhood will bring happiness the Only Fools and Horses star feared had eluded him. For almost two years he hid his grief when his partner of 20 years, Welsh actress Myfanwy Talog, died of breast cancer in 1995 at the age of 49. David threw himself into work but Gill gradually drew him out. He said: "It's nice to have someone as lovely as her, who is so caring and loving, after all I've been through. She's great. People are always asking me to do things, making it hard for me to relax. Gill guards me from all that pressure, takes the phone calls and keeps the pressure off so that I have to do the minimum work." Don't bank on him being there for the birth, though. David laughed: "I am soft. I can't stand cruelty to animals or seeing anyone in pain. I'd leave the room." Friends have warned them to make the most of their time together because the new arrival will turn their world upside down. "It's a brave new world, so they tell me," David said. "I've already heard all the horror stories. "But everybody I speak to seems to laugh and smile." Like TV sidekick Nicholas, 39, and 27-year-old ballet dancer Lucy, who live in a pounds 500,000 mansion in East Wittering, Sussex. For once, Britain's best loved dipstick can confidently dish out the advice to Del on how to change nappies and handle late night feeds. And Rodders can have the last laugh. He managed to get to Harrods just before the sale ended. Not bad for a plonker. David Jason said he almost fainted when his girlfriend told him she was pregnant. Speaking of the moment she told him he said, "I almost fainted. When I regained consciousness a month later I felt pleased. But for the first month I was not there. Whether you can say through pleasure or horror, I don't know." David and girlfriend Gill Hinchcliffe are expecting the baby spring 2001.